The CMPS09 module is a tilt compensated compass. Employing a 3-axis magnetometer and a 3-axis accelerometer and a powerful 16-bit processor, the CMPS09 has been designed to remove the errors caused by tilting of the PCB. The CMPS09 produces a result of 0-3599 representing 0-359.9 or 0 to 255. The output of the three sensors measuring x, y and z components of the magnetic field, together with the pitch and roll are used to calculate the bearing, each of these components are also made available in there raw form. The CMPS09 module requires a power supply at 3.3 - 5v and draws a nominal 25mA of current. There are three ways of getting the bearing from the module. 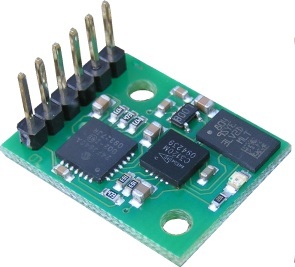 A serial interface, an I2C interface or a PWM output. Accuracy - Horizontal, 3-4 degrees.